Winners of the prestigious Roux Scholarship competition in the UK are allowed to choose a three Michelin starred restaurant anywhere in the world for a three-month stage. When Sat Bains (b. 1971) won the competition in 1999 he picked Le Jardin des Sens, the then famous three-star restaurant in Montpellier, run by the Pourcel brothers. Working there at the same time was René Redzepi and they've been friends ever since. Sat's initial choice, however, was Michel Bras in Laguiole, but Bras wasn't taking on any stagiaires that year. In 2005 Sat Bains and his wife Amanda were able to take over Hotel/Restaurant de Clos in Nottingham, a restaurant where Sat had been head chef since 2002, winning his first Michelin star in 2003. 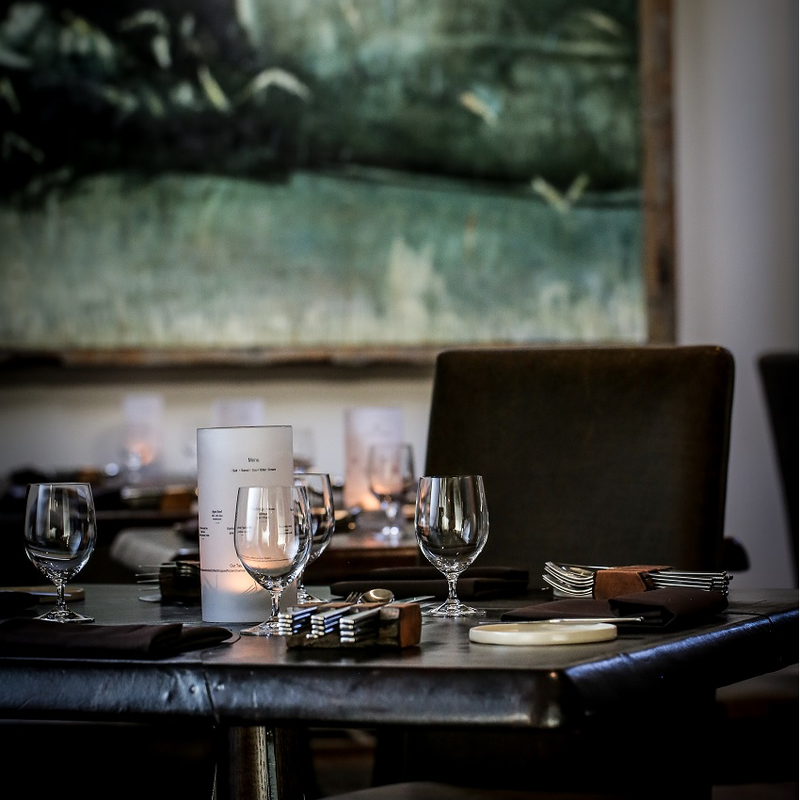 After a four-month refurbishment the place was relaunched as "Restaurant Sat Bains with Rooms". In 2011 the restaurant was awarded a second Michelin star and the following year he published his first cookbook "Too Many Chiefs Only One Indian". Restaurant Sat Bains is open for dinner Wednesday through Saturday and the restaurant offers two multi-course tasting menus (7 courses £95, 10 courses £110). Lunch is available to book at the Chef's Table, Kitchen Bench or at Nucleus, a separate development kitchen space which seats 6 people. Nucleus is also available to book for dinner. 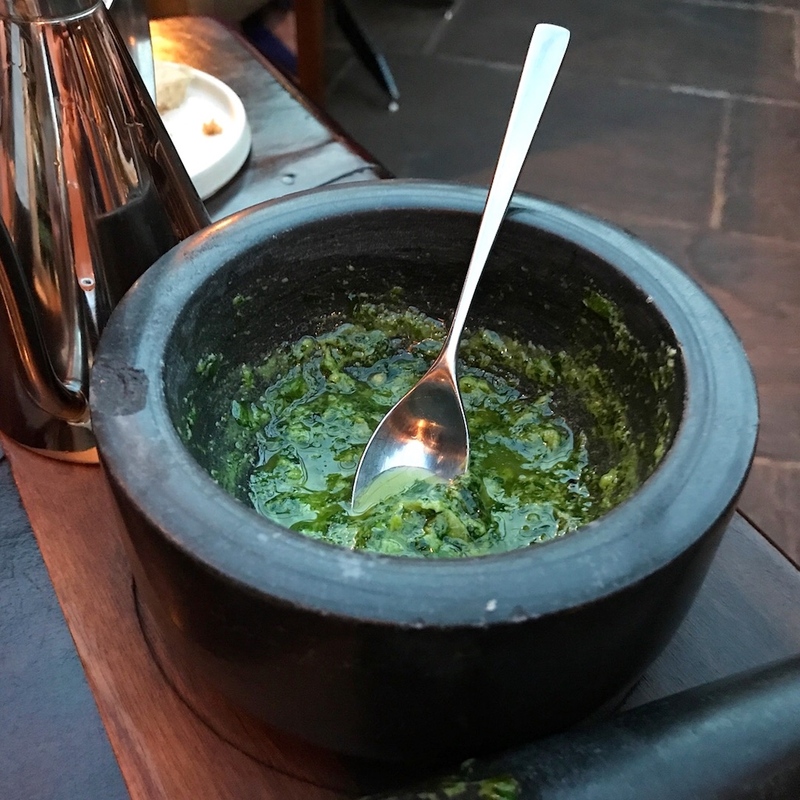 I had dinner with my husband at Restaurant Sat Bains in August 2017 and we both ordered the 10-course tasting menu. *I was recognised and I was served one complimentary dish (sweetbreads). Dinner kicked off with two appetisers, a crisp cornetto with a nice and sharp horseradish cream filling, and a perfectly thin brique pastry cylinder filled with fresh garden herbs and served with a smooth and nicely balanced lovage mayonnaise for dipping. 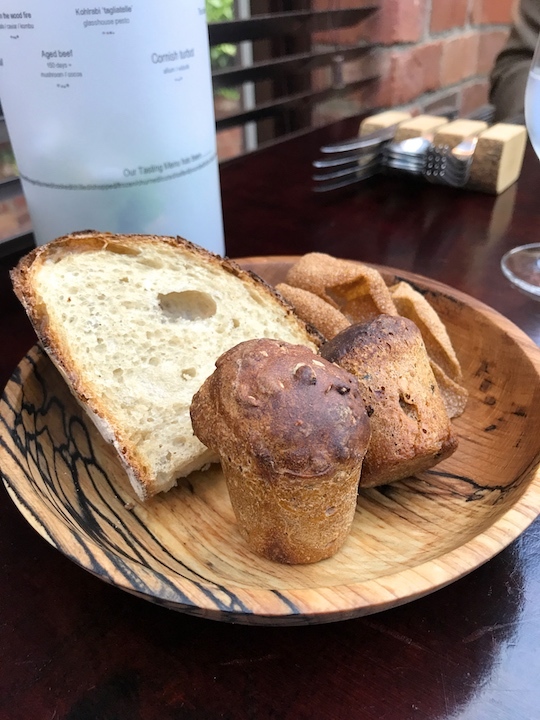 Homemade bread: sourdough, treacle and crisps served with cultured butter. First course of the tasting menu were scallops, one served warm and one served raw, and both topped with a mixture of concentrated tomato confit, fresh chopped strawberries and a garnish of basil cress. Spooned over the scallops was a warm sauce vierge oil and on the cold scallop there were two tiny dots of elderflower crème. 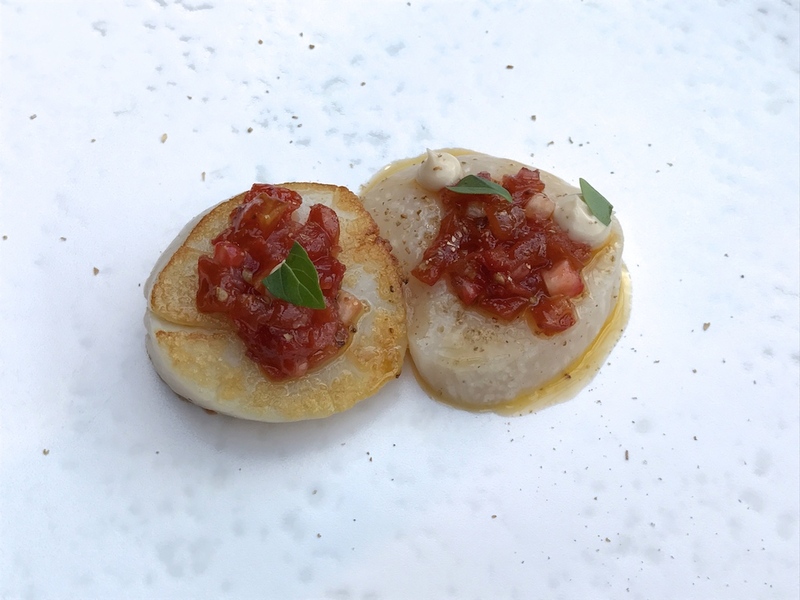 The warm scallop delivered a harmonious flavour combination with a great sweet and salty balance, and warm umami notes coming from the tomatoes. 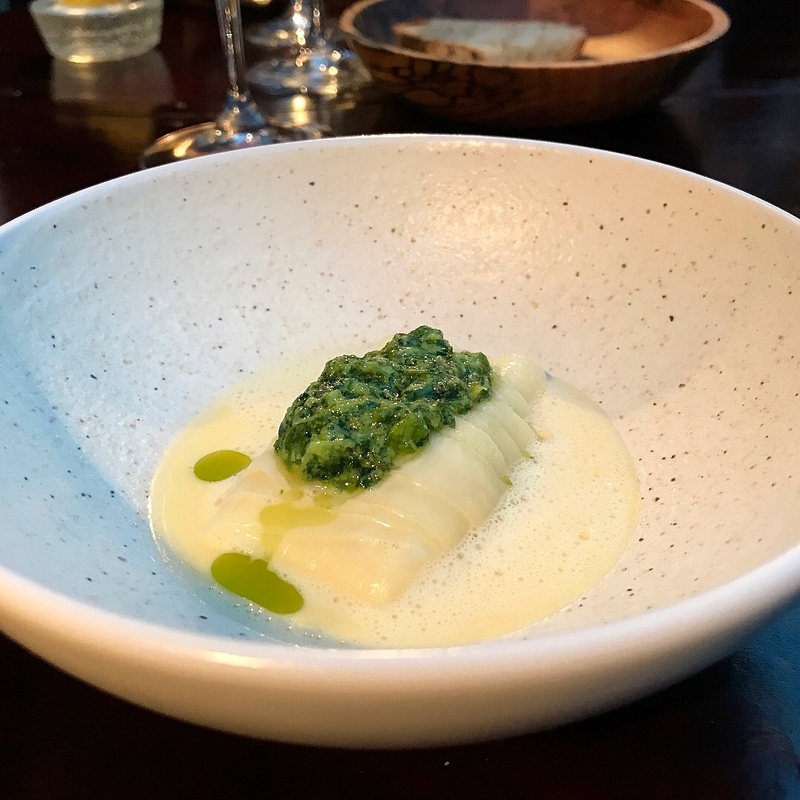 The raw scallop, on the other hand, provided more contrasting flavours with subtle floral hints from the elderflower and an intense, sweet finish. Two wonderful preparations. A strong start of the tasting menu and I really enjoyed the temperature contrast in this dish. 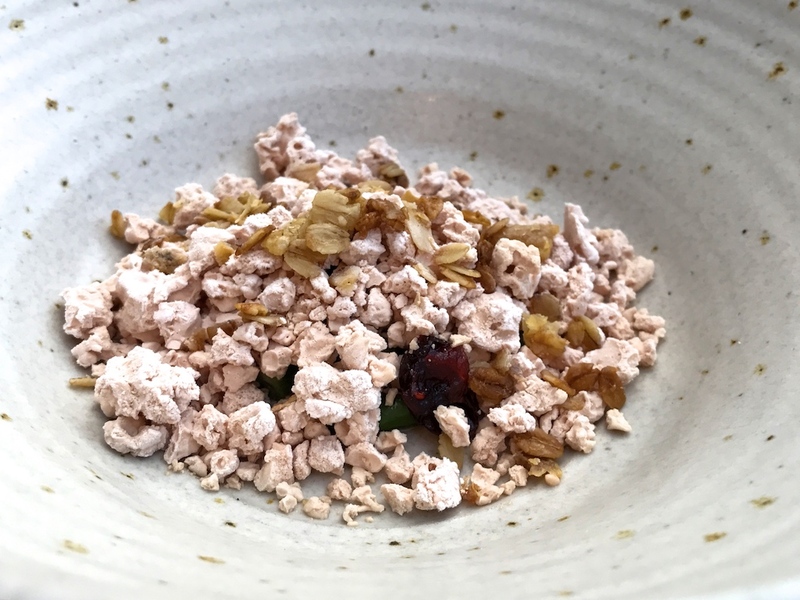 Second course was Chicken "muesli", chicken referring to little lumps of nitro chicken liver mixed with crunchy granola, and pieces of crisp chicken skin. Hidden underneath this mixture were some snappy, chopped green beans, a sweet and sour apricot puree and some pickled cranberries. A highly creative and inspired dish with a beautiful interplay of textures: the attractively seasoned nitro liver melted in the mouth and its richness was balanced out wonderfully by the zingy acidity of the apricot puree and the pickled cranberries. And finally, the green beans brought a lovely juicy freshness to the plate. 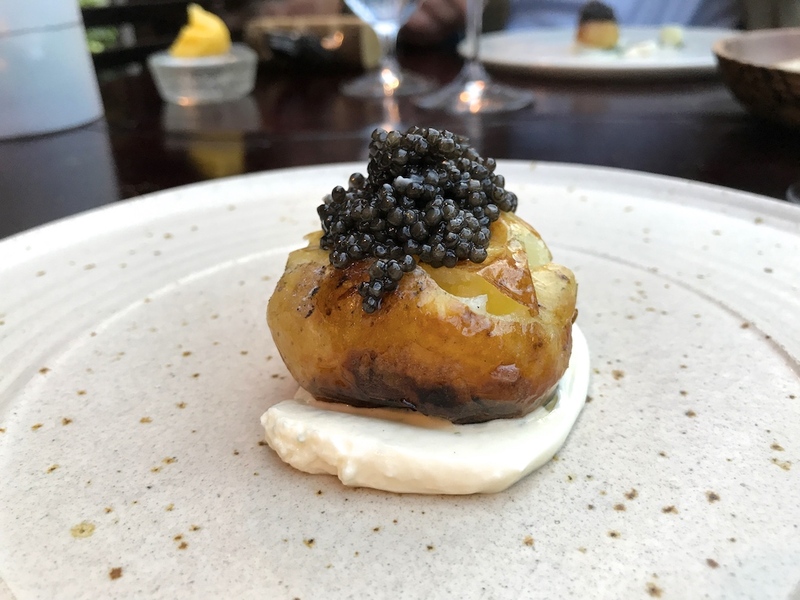 After this texturally exuberant course, the next one was a more comforting dish of crisp-tender potato (wrapped in kombu and slow-cooked in a wood-fired oven) served with chive crème fraîche, a generous dollop of Baeri caviar, and some kombu puree. A dream of a flavour marriage and a pleasing hot-cold temperature sensation. 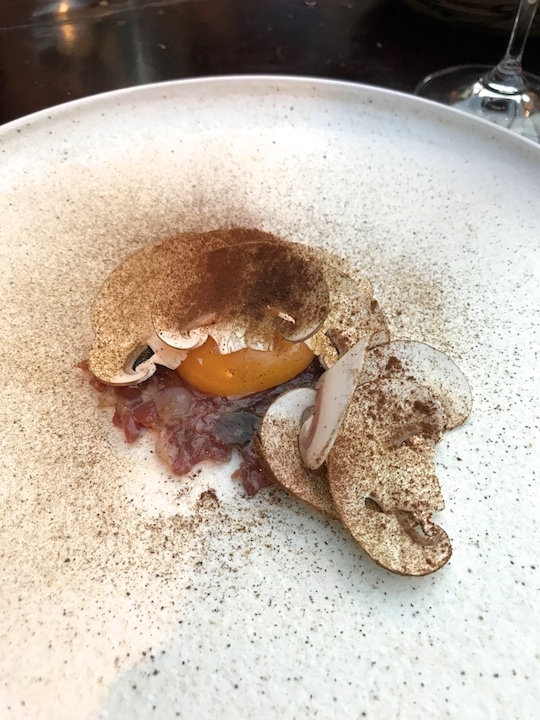 Fourth course was a tartare of aged beef (150 days), beautifully seasoned with mushroom ketchup and aged beef fat and topped with a perfectly jammy egg yolk, thinly sliced raw mushrooms and a dusting of cep powder. An exceptional dish with exceptional flavours. The 150-day ageing had given the beef a deep and haunting flavour with a high level of umaminess and the beef fat delivered a nice long finish. An intense flavour experience, the delicate raw mushrooms lending lightness and balance. Next up were deep-fried breaded veal sweetbreads, crisp and golden on the outside and wonderfully delicate and moist on the inside. 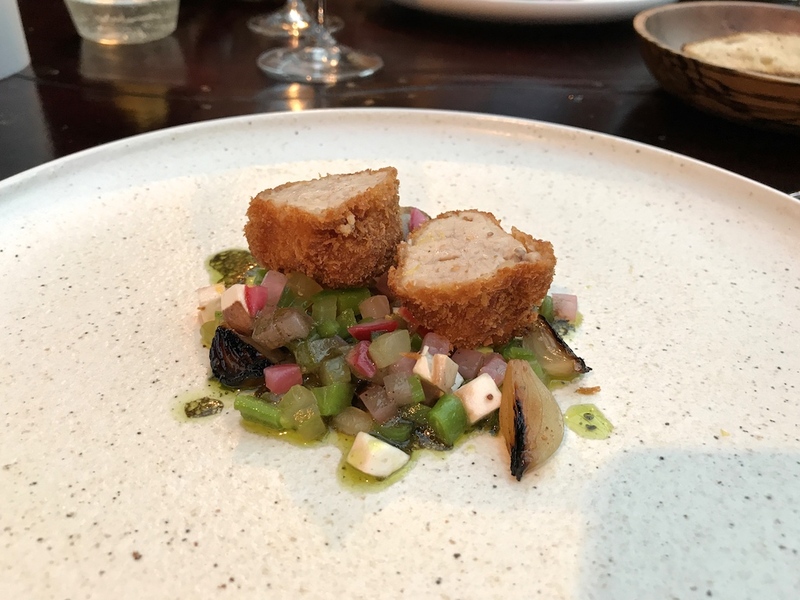 The sweetbreads were served on a little salad of pickled garden vegetables (including green beans and radishes), charred baby onions, little cubes of feta cheese, basil, and finished with a truffled (Australian truffle) vegetable vinaigrette. An original and sumptuous combination of ingredients and textures. 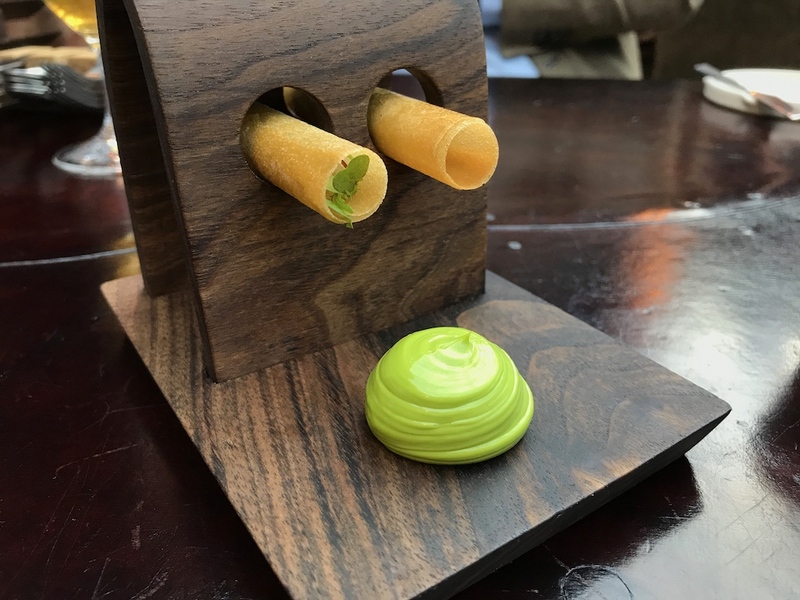 Equally sumptuous was kohlrabi tagliatelle, cooked in a Parmesan emulsion, with a nice satisfying bite, and complemented by a fresh garden herb pesto (made tableside), which lifted the dish and added a pleasant touch of complexity. The main and seventh course was a very successful pairing of Anjou pigeon with melon, feta, carrot and mint. First the pigeon. There were two beautifully cooked, ruby-red fillets, the leg meat had been used to make a delicately crisp pastilla, which had a lovely Moroccan spice and coconut seasoning, and finally the pigeon's liver had been turned into a creamy and velvety paté served on sourdough toast and garnished with thinly sliced radish, shallots, pickled cucumber and mustard leaves. Also on the plate were some gorgeously rich, almost candy-sweet roasted carrots, a smooth carrot puree, and a wedge of caramelised melon garnished with crumbled feta cheese and finely chopped fresh mint. 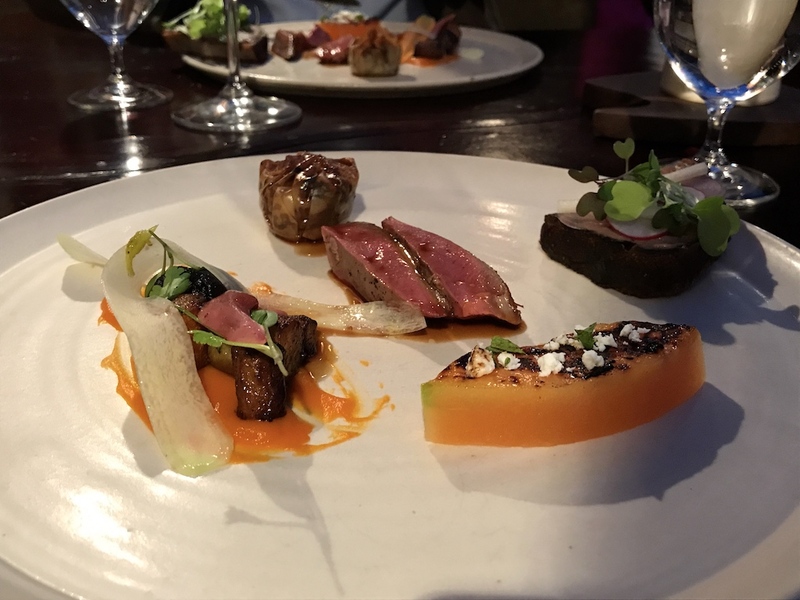 A carefully constructed and executed dish with a striking tension between the richness and intensity of the pigeon and the carrots on the one side, and the fruity succulence of the melon on the other side, the feta cheese providing a nice counterpointing saltiness. 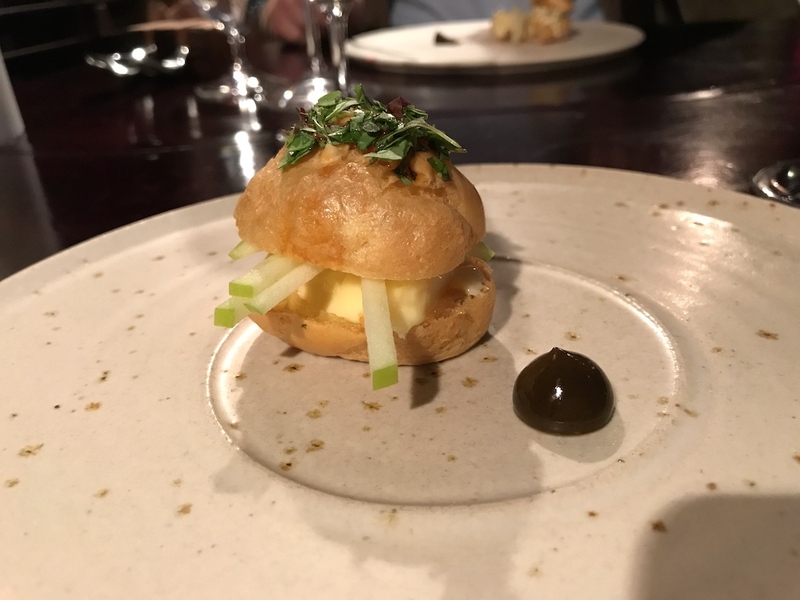 The cheese course was a delightful choux bun sandwich with Baron Bigod, a creamy and pungent raw milk farmhouse brie from Suffolk, and fresh green apple strips, served with walnut ketchup. This was followed by a so-called "Crossover" course, a course designed to prepare your palate for the switch from the preceding savoury flavours to the following sweet courses. Today's crossover was a savoury-sweet bite of miso caramel with passion fruit and sea salt. Dessert was an exquisite chocolate marquise served with 9 year aged balsamic vinegar, cocoa sorbet and some chocolate and sea salt crumbs. 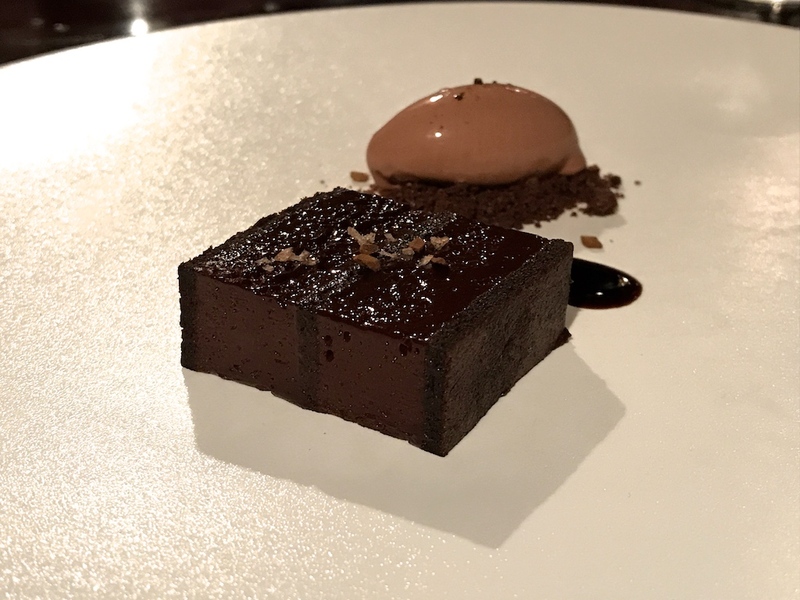 The marquise was comprised of beautiful layers of rich and shiny chocolate mousse and moist chocolate cake, finished with a light espresso glaze. The bitters of the espresso provided a nice balance for the richness. Especially delicious though, was the combination with aged balsamic vinegar. A very pleasing chocolate dessert, not too heavy and technically perfect. 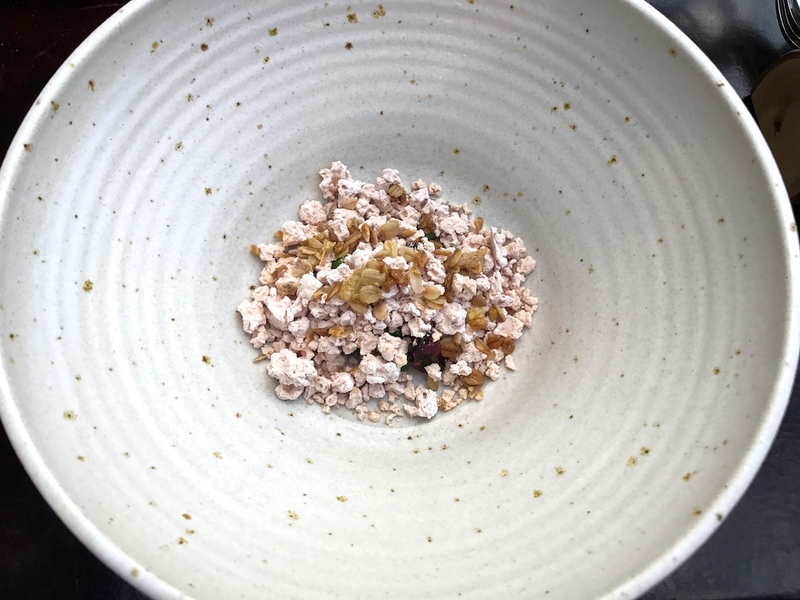 This was followed by a refreshing and elegant dessert of milk ice cream with sweet and sour raspberry compote, yuzu gel, brittle dehydrated milk crisps and some dried meringues that had a nice touch of acidity to them. 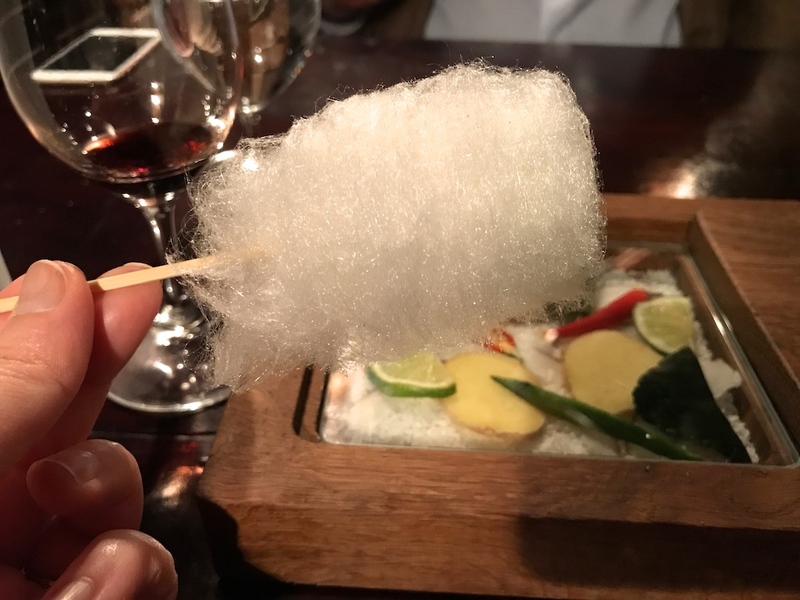 The meal was concluded with some sweet treats, including a delicious thai green curry ice cream wrapped in candy floss. Tasting menus generally come in two forms. There's the menu which is a compilation of a la carte dishes, usually up to 6 or 8 courses, and there's the especially designed tasting menu, often served at tasting-menu-only restaurants. The best compilation menus can be a real joy, but all too often you come across tasting menus that are devoid of imagination and avoid risk. The only risk which remains is that the tasting menu portion doesn't have the same impact as the a la carte version. And aren't we all looking for the very subjective but ever important "wow-factor"? Few get tasting menus absolutely right. Restaurant Sat Bains does. Today's menu was cleverly composed with real verve and virtuosity and it was accompanied by enthusiastic and friendly service. 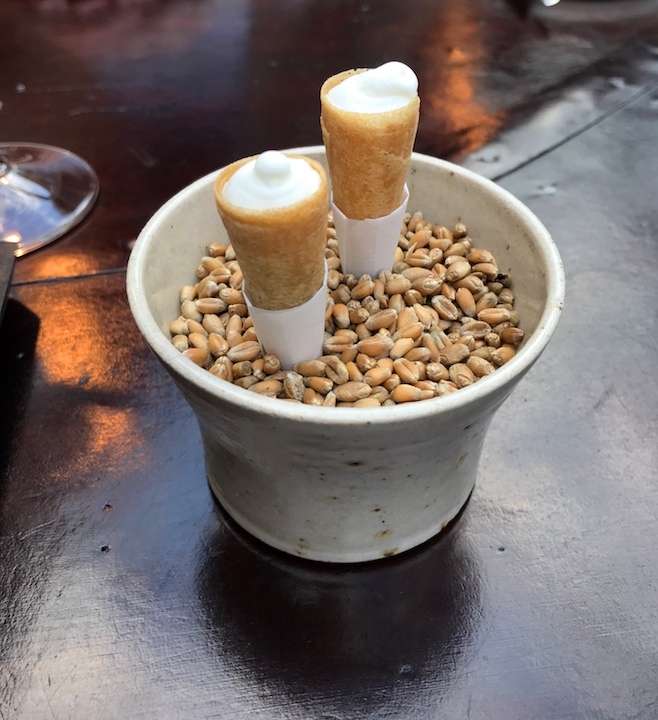 When I visited Restaurant Sat Bains back in 2012, the restaurant had just been awarded its second Michelin star, and I had a convincing meal then. At the time there was already a strong focus on taste, texture and temperature, a philosophy that has been further perfected with harmony and complexity. With their sagacious and imaginative dishes Sat Bains and his team, with a special mention for his right-hand man John Freeman, demonstrate that they are still ahead of the curve and that they deliver an exciting journey with surprising texture and flavour combinations with respect for the ingredients. 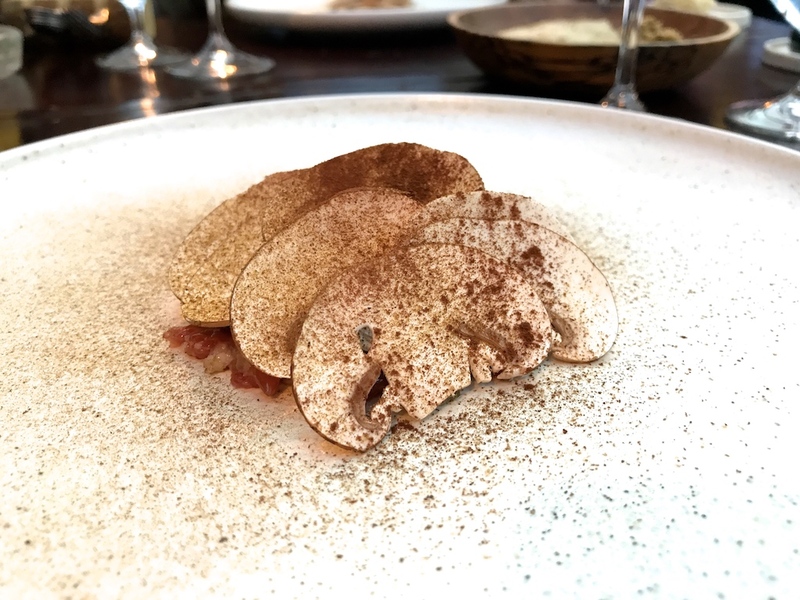 Stand-out dishes were the beef tartare & mushroom, the potato & caviar (simplicity at its best) and the chicken muesli, which is a great embodiment of the taste, texture and temperature trinity. I ended my 2012 review saying that I would be interesting to see how Sat Bains' food would develop over the years, and five years later I'm happy to report that Restaurant Sat Bains is now among the very best in the two-star category in the UK, and that's including London.